Switch off, plug in and connect to the best gaming chairs this year has on offer. Your next best gaming experience starts and ends right here. Gamers – are you ready? Comfort, style and the need to be totally immersed in your game is all that matters. Truth be known nothing else matters when your game is on. You need to be there in the zone and it’ll never be quite right if you’re sitting “un”-comfortably. Before we carry on, we wanted to let you know our top rated gaming chair. The one that shone out best for us was the CTF Pro from Cherry Tree Furniture. For this project we decided to push the boat out and order 15 different gaming chairs so that we could scrutinize every last one of them. What is a gaming chair? It’s a super comfortable chair that allows you to sit back in sheer comfort and attempts to “put” you into the game by filling your senses with audio and sensory vibrations from the game. For those of you looking for the best performance paired with the best price then look no further. Out of all our testing our current “favourite” recommendation is the CTF Pro from Cherry Tree Furniture. When it calls the chair can vibrate, perhaps in time to an explosion, or a drive over a rumble strip or when being shot at. Wireless connectivity is one such feature and makes the game play even more pleasurable. A new router has been released for gamers who need to best.. It’s the Asus’ ROG Rapture GT-AC5300 router. The Straits Times has an interesting article on it mentioning it’s 8 Gigabit ethernet ports (to keep speed up to it’s best, despite improvements in WiFi). Check it out here.. Some manufacturers class a gaming chair as a fully immersed experience with all the bells and whistles but at the “lesser” end of the range are, well basically chairs that are nothing more than that. At the lesser end you will find what are essentially office chairs that look a little bit more funky in their design. For example, they might look like a car seat, or a racing car sports “bucket” seat coupled with the obligatory must have all important roof “stripe”. At the higher end you get to enjoy wireless connectivity, 2.1 surround sound, chair vibrations, swivel chairs and so much more. So that said, these variations have been produced to handle a wide variety of budgets. You can find gaming chairs for well under £50 and obviously upwards in price. These are what helped us score each chair and produce this list of our best top 10 chairs for gamers. For all intents and purposes this is an excellent chair, as long as you’re not too tall. Anyone who is taller than about 5′ 6″ up to 5ft 8in might find it a touch uncomfortable with the headrest not being in alignment. Along with what we feel are a few “minor” build quality issues these are the only two “real” niggles. Other than that it is just brilliant! Perfect for most kids and many adult gamers. X Rocker have built an enviable reputation for being some of the best in the industry. Could this be the best console gaming chair? Read on to discover the rest of our top 10 and make your own mind up. This Mini X Rocker gaming chair is the younger smaller version of the larger X Rocker. These chairs are the type that sit on the floor and are designed for comfort, kicking back and relaxing. Please note these are not designed as office chairs (just in case you wondered). This seat is rather cute – and awesome at the same time. Suited to under 10 year old’s. Dimension wise you are looking at 57.4 x 43.6 x 37 cm. When you open the packaging you get a 3.5mm audio cable and the chair. It has a nice tough Black faux leather finish to it which feels like it will stand the test of time. Also comes with access to their UK call centre for any specialist help you might need. Perfect audio reproduction with the two speakers built into the upper section of the chair- for that brilliant immersive experience that comes with a chair like this. Compatible with all known consoles. The chair connects to your TV/Monitor’s “audio out” sockets, and the other end of the audio wire connects to the audio in socket on your chair. This is by way of a 3.5mm cable. If your TV’s audio out is anything other than that you may need an adapter.
. Many TV’s will simply have a standard 3.5mm jack audio out though so the supplied cable will be fine. Suffice to say that any X Rocker is usually going to be good. They are leaders for a reason and by and large most of their chairs are pretty solid choices to consider. Finally if you just want to sit in your chair and watch Youtube on your phone or tablet you can do that too. You could even cable the tablet to the chair speakers to enhance the listening experience.. would be handy if you’re trying a bit of Karaoke.. “a La Gamer chair style”! Just remember that although it is well made, once your child grows they may want a larger one. On a side note the audio reproduction is never going to be a state of the art audio sensation but it is adequate enough for most things. 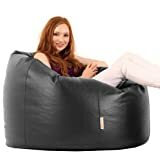 There are quite a few adult gaming bean bags on the market too (take a look here) which would obviously get a lot more use, but for kids rooms the i-eX Rookie is perfect. 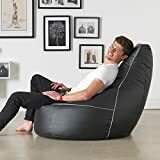 Clearly it’s a bean bag but a bean bag that is shaped to provide more support for your neck and back and helps provide a great gaming position. I’d just like to point out that my son is quite heavy handed in everything he does. Our sofa is used as a springboard / adventure park more times than I care to mention, despite several warnings. This chair has been a bit of a godsend and to be honest it’s his new “best thing”. We popped it onto the floor in his bedroom and with a little adjustment of the monitor he stayed pretty quiet for a long time. Later he came down and said “that chair is sick daddy”… sick? I said? Yes he smiled, “sick”. Great looking, and a major improvement in your average computer chair. This one makes you feel like you are sitting behind the wheel of a 1000 horsepower set of wheels, ready and waiting for your command. The appeal with this chair is it can be used for every day office or other desk work. Then when the office work is done, it’s time to kick up a gear and get into racing mode – or fighting mode – or challenge mode – or whatever gaming mode you want to. Height from seat back to floor: 110 to 120cm. Height from seat to floor: 47 to 57 cm. Seat back height x seat width: 80 x 53 cm. Seat depth x seat width: 51 x 51 cm. Height From floor to Armrest: 68 to 78 cm. This unit is easy to assemble. It comes with a supplied allen key and instructions. If your budget can afford a premium product then this is a definite worthy contender. The GT Omega pro is many gamers’ first choice in chairs. However note that it also serves as a BRILLIANT orthopaedic supportive office chair, so you could it to make sure you always have the best seat in the office. We wouldnt recommend leaning right back as any chair could tip over like this! Also available in Black and White leather finish, as well as Blue and Black leather finish and also a Green and Black leather finish. Comfort levels are good but firm. That’s provably a good thing in our opinion. certainly better for your posture over longer gaming periods. The chair overall is very well made and allows for adjustment in pretty much any place you need. Brilliant for small and taller people – even those over 6 foot tall (and 16 stone) will enjoy this chair. Usually closer to £90, at the time of our testing this was priced at just under £40 (a superb price!). It’s devastatingly comfy and for the price we were left laughing before sitting down for the testing stage. So joking aside what did we think to it? The stitch work was second to none. The shape is really good, in so much that it supports your neck really well when laying back for some serious gaming time. It’s got double stitching and double zips for strength. The material is easy to wipe clean, so easy to keep hygienic during hot sticky summers. In at number 7 is this dark horse entering the Foray. It’s made by Cherry Tree Furniture (aka CTF) and with it’s vivid Lime Green colour scheme it looks just superb! It looks similar to the GT Omega Pro but is almost half the price. Fully reclinable although in practice not exactly practical and could probably tip over! Quality build – it’s a full metal frame built structure with superb comfort levels. Has an included headrest pillow and lumbar support cushion which can be removed – making it great for work rest or play! Adjust the armrests (between 60 and 72cm in height), the seat height and also benefit from multiple recline positions. Passed SGS and BIFMA tests for guaranteed quality and durability. Surprisingly this generic branded chair opened our eyes! 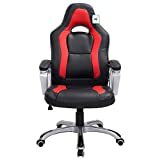 For all intents and purposes it is a superb gaming chair and connects to all major consoles, ipads, tablets phones etc. This particular gaming chair seriously surprised us. It’s just like a high end gaming chair but without the associated price tag. Crazy. It features twin integrated speakers for that expected audio experience. It is compatible with all game consoles and with PC`s Tablets and iPhones & iPads etc. It comes with a standard 1 years warranty from the manufacturer. It can be folded in half for easier storage when not in use. Can be used when you just want to listen to MP3’s etc. Connect several chairs together for the ultimate gaming party. Looking for “premium quality” ? Epic is the name. Epic is the price too. This chair holds up to 28 stones in weight, and it has a 2 year warranty to go with it. Executive office or high class gaming chair – the choice is yours. Every part of this chair is fantastically desirable. You feel like you’ve sneaked into the office of someone incredibly important and trying out their chair, measuring yourself up for the position. So what’s this high end product REALLY like? Extra soft and thick real leather, with 55% density freshly moulded cold foam for optimal breathability & comfort. Reclinable to 135 degrees, with arm rests adjustable in 4 dimensions for fleixble adjustment options. 180kg maximum user weight with a 2 year UK warranty for peace of mind. 60mm PU castors for soft & hard floors, with both neck and lumbar support cushions supplied. Ergonomically & expertly designed with a solid steel frame, premium stitching and debossed logo. Who else wants all the features but for a fraction of the price? That was our initial thought once we realized what we had here. A chair that is so comfy and offers Bluetooth connectivity and so much more. Vibration, power and bass controls..
A wonderful vibration motor ensures you are placed right into the middle of the action whether that be an epic battle on COD, or watching a move. All the controls you could ever need. Link two or more together for the ultimate cinema experience. When we opened it, it was pleasing to see that every last item was well packaged. Smaller parts in a separate box to the bigger parts all inside one big box. Overall we really like this chair. For the money it’s a great chair and has features not normally found within this price range.